It's a combination of a ring-opening polymerization with a normal addition reaction. I've not read the full article yet ($) so I'm not quite sure how versatile it is - can something beside a lactone be copolymerized, such as a lactam? No matter the exact robustness of the reaction, this does open up (sorry about that pun) the possibilities for a number of new polymers that could be pretty simple to make. The other reaction involves the crosslinking a chain with copolymerized catechol moieties. Copolymerizing a substituted catechol (aka dihydroxybenzene)[*] is a little bit tricky as the hydroxy groups need to be protected during the polymerization, but the authors report ($) a fairly straightforward process for accomplishing this. The magic though, is in the crosslinking. Two options are available. An irreversible one directly between two catechol groups, and a reversible one between a multivalent metal, in this case Fe3+. While I really love the dual approaches to crosslinking, the monomer used for the bulk of the polymer is styrene, meaning that the final polymer is not water soluble. That makes is much more difficult to achieve the ionic crosslinking, since you need a solvent that will both dissolve the styrene and also ionize the ferric salt. Water soluble monomer/polymers would be desirable, but I think that a different protection scheme for the catechol's hydroxyl groups would be needed. (I suspect the triethylsilane protecting groups would hydrolyze.) 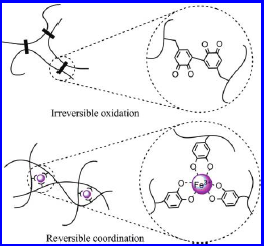 Regardless, designing a polymer with two different crosslinking schemes (and two levels of reversibility) is quite novel. [*] If you do decide to try this reaction, remember that catechol is a nice little skin irritant. The active ingredient in poison ivy/oak/sumac is urushiol, a catechol derivative. That's really fabulous, I have never seen such type of cross linking, especially after substituting catechol the final polymer is water insoluble. and I think to crate a monomer which is water soluble after such type of reaction must be more difficult.